Need Financial Help to save a preterm child born at 25weeks of pregnancy !!! Raju and Amirtham's 8-month-old baby boy named Ashwanth. He was born on 31st December 2016. During 20th week of pregnancy mother's amniotic sac broken and both twin baby struggled 4 weeks inside mother's womb and prematurely born on 25th week of pregnancy. This couple were longing for a baby for more than 10 years and they got conceived with triplet with Assisted Reproductive Treatment.Due to medical complications they lost one of the baby in initial weeks of pregnancy.With God's grace the couple continued their pregnancy with twin babies. Both babies (baby boy and baby girl) prematurely born on 25 the week. Babies were kept in NICU and a month later Baby girl passed away.Its almost 8 months still baby boy is in NICU since he has severe breathing problem due to this his lungs are not developed fully. 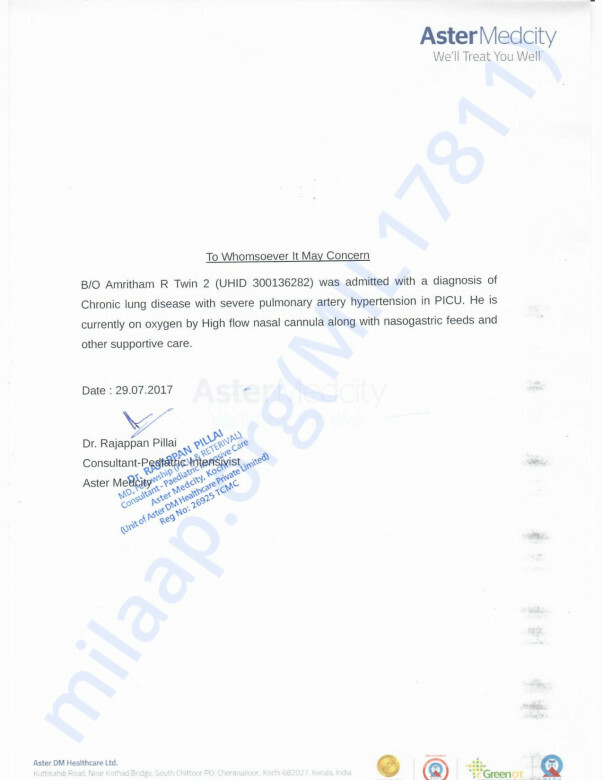 Ashwanth is suffering from Chronic lung disease with severe pulmonary artery hypertension in PICU. He is currently on oxygen by High flow nasal cannula along with nasogastric feeds and other supportive care. They have spent more than 20 Lakhs till now and more funds needed to continue Baby's treatment. Baby Ashwanth is struggling for his life even before he came into this world and fighting still. 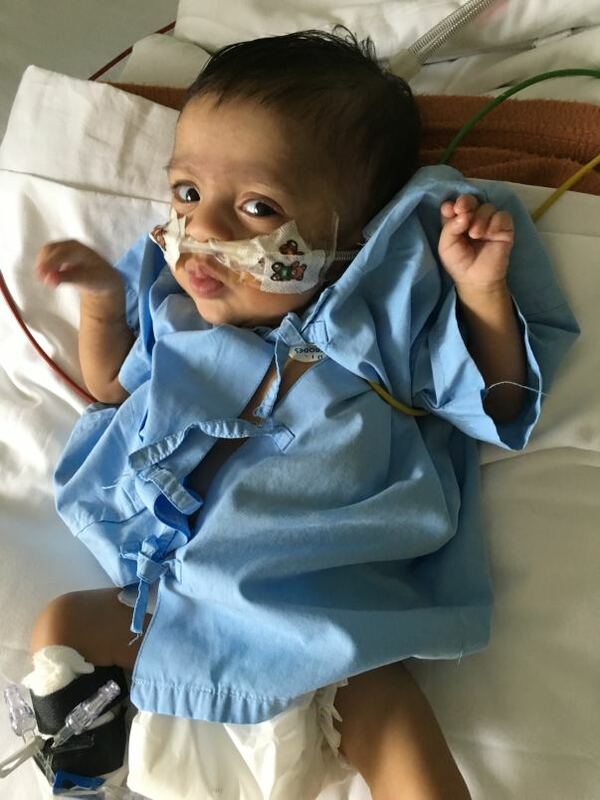 Please help this baby Ashwanth who is really fighting for his speedy recovery. I have some unfortunate news to share. 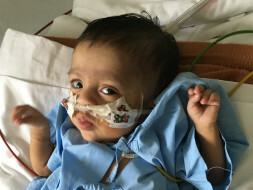 Baby Ashwanth passed away on August 29th. This brave child endured so much pain and fought so hard for his life. He was struggling to breathe and doctors were working on getting his lungs back to normal. Unfortunately, his body was unable to take the stress. Your timely support ensured that he received the best medical care. I am withdrawing the funds raised here to my account to pay for expenses. The family is grateful for all the care and support you’ve shown Ashwanth. The past month has been the most difficult for the family. May they find strength in this time of grief. May Baby Ashwanth's soul find peace. Please keep the family in your prayers. Thank you for the support once again. May God give you all strength to fight and come back even stronger and healthier.lots of.hearts praying here for you! God bless! Welcome to the world Ashwanth.